While most of these new artist posts profile, well, new artists, I am going to change it up a bit and recognize a solo artist whom you may not know from his extensive solo material, but you very well could have heard of from his band-work. Neal Casal is best known for his lead guitar with Ryan Adams and the Cardinals where he recorded four successful albums with the band. 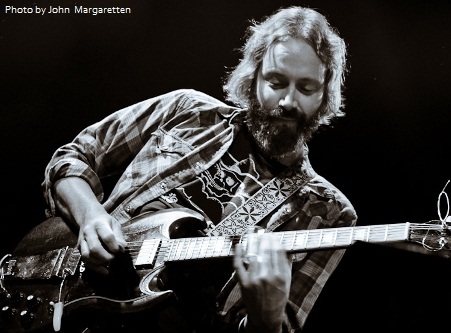 When the group went on hiatus in 2009, Casal continued with several projects, and, in 2011 joined forces with Black Crowes’ frontman Chris Robinson as lead guitarist for his project called the Chris Robinson Brotherhood. They are going to jump in the studio and cut an album, by the way. As well as being a talented guitarist, Casal has an excellent voice, and band-work aside, he is an accomplished solo artist who just recently released his 10th studio album entitled Sweeten the Distance, a splendorous collection of engaging alt/country tracks. Let’s be honest. Many lead guitarists cannot sing. Casal can. He can sing well, really well, and such a voice can often fall to the background of a band with a leadman at center stage. His solo work allows him to shine and today I want to profile a couple of songs off of his new album. My initial thought after delving into the picked acoustic guitar and feasting on the whiny electric and laid back percussion was comfort. The music invokes images of a sun-doused grass and air that smells like sweet corn bread. It is melancholic but just so easy to sink your teeth into. Casal’s voice fits the melody well and sparked an immediate comparison to a countrier version of Josh Ritter. The song itself actually reminded me a bit of Ritter. The chorus features easy harmonies. Like I said, it is an exceptionally easy listen and it is engaging, and like any summer afternoon it fades away and ends too quickly. “Time and Trouble” is the other track I have for you. This one is immediately different (the feedback comes as a bit of shock – but multifarious sounds are good especially when they are unexpected). Two guitars play over each other before Casal’s voice comes in to complete a Beatles/Stones-like rhythm that bops quickly and leads into a rich chorus jam-packed with harmonies, twang, and the easy-to-drum-along-with percussion. This song is more upbeat and gets you moving a bit. Great sound to this one as well. Interesting feel to both songs, and very different from each other. Very comfortable.